Want a great experience that can help you in your college search? Have an overnight visit on campus. It's like getting a free sample at the ice cream shop, only instead of eating mint chocolate chip off a wooden spoon, you get to see college life outside of the classroom, live in a residence hall for an evening, and learn what to expect when you head off to school. Read more for advice on how to stay overnight at a college and for tools you can use to plan your visit. Some colleges host high school students who want to stay overnight. Official programs like these have a few advantages. The college will handle the logistics of rooming you with a current student. If you don't already know someone on campus, like a friend or family member, this can be a big help. Often, visit coordinators try to house high school students with college students who have similar academic and extracurricular interests. This can be a great opportunity to get unfiltered opinions about the school. Official overnight visits may have more structure than when students stay overnight at a college on their own. When you visit independently of one of these programs, you have to depend on your host to help you see the school and to take part in activities that will interest you. 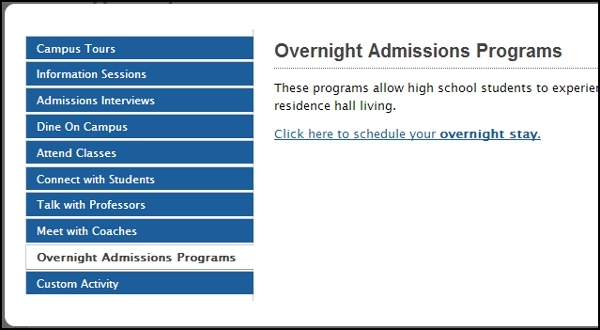 Go See Campus helps you schedule overnight visits through the College Trip Planner. Just include a school in your trip plan, click the "Add a New Activity" button, and look for a link to an overnight admissions program. See the screenshot below for more detail. If you are traveling to a city that can get extreme weather--heavy snowfall, for instance--it's a good idea to look at the forecast in advance. Bring clothes for both casual and formal situations, especially if you are planning to meet with admissions staff during your stay. You may want something for writing notes about your experience on campus. This can be very helpful later on! For example, if you decide to apply to the college, you may have to answer admission essay questions like, "Why is this college the right school for you?" Referring back to your campus visit notes can help you with these college applications. Think twice about packing expensive items and valuables. You will be on the move a lot during your stay, and you may have to leave your luggage unsecured in a residence hall. Does the school not have a host program? See if you can stay overnight at a college with a family member or a friend who's a student. Check regulations for the residence halls in advance, though. The college may have a special process for authorizing guests. When you visit campus outside of an official university program, it is up to you and your host to plan activities for your time on campus. Some high school students decide on a college just by spending a day hanging out and grabbing dinner with friends from the residence hall. Others prefer a day-in-the-life experience: attending college classes with the host or going to student events. Visiting outside of a program means that the high school student could have a great, authentic college experience. Or, he / she might end up bored because the host never wants to leave the residence hall. Have in mind a few things you would like to do when you visit, and be ready to take the lead if you feel you aren't getting what you want out of your stay. A parent may be concerned about a high school student staying overnight at a college without adult supervision. Official university programs may offer structure that eases some of these concerns with set times and events. However, whether students are visiting as part of official university programs or staying with friends, they are responsible for their time on campus. Visiting schools is an important way for students to learn about the opportunities and challenges college will offer. There are many positive experiences available to them, like cheering at sports events or getting to know people who could end up being their classmates and professors. High school students may also be faced with real college issues, like underage drinking. For this reason, Go See Campus encourages an open conversation between parents and their children about the campus visit. This is an important opportunity for families to talk about the freedom and responsibilities of visiting college and, ultimately, heading off to school.